Sending invoices has never been this easy We've made it simple - and it's free. Free online invoicing. Managing invoices and payments has never been this easy ! Mr. Biller is one of Australia's fastest growing start-ups. We developed our product because we couldn't find an easy, affordable tool for businesses that need to generate lots of invoices in super-quick time. That was back in 2012. Since then, our team has been working on making Mr. Biller the most user-friendly small business invoicing platform on the market. We reckon we've done it - check it out! Understand your clients better with our simplified system. We keep our brand name off your invoices – because they're yours. 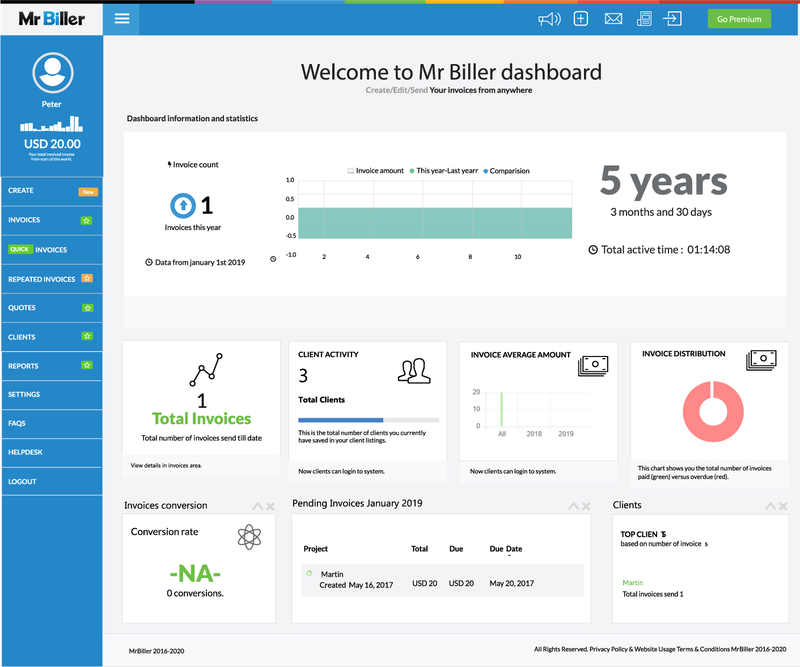 The newly-designed Mr. Biller dashboard is the place where you can check all your business and growth statistics. It's similar to the Charts section, but easier to understand. The newest feature is the ability to set your business goals in a simple, easy manner. We want you to understand your business better because it's Your Business. We understand and appreciate that because when you grow - we grow. This is what Mr. Biller is known for – it's so easy to use. And we're always working to make it better. Most of the accounting-related software on the market is for big business. 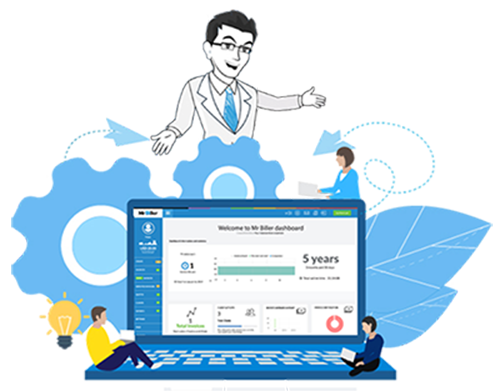 Mr. Biller is for people like us, who are running small businesses and who don't need (or want to pay for) all the features supplied by professional software. Send and track professional looking invoices in minutes with our easy to navigate dashboard. Monitor your business growth with our crystal-clear reports. We make invoicing easy. Bill your clients and get paid fast. Generate a free online invoice in just 30 seconds. You will love it ! Create and send professional looking PDF invoices online. Free and simple online invoice templates available for your business. You can automatically calculate your taxes and totals. 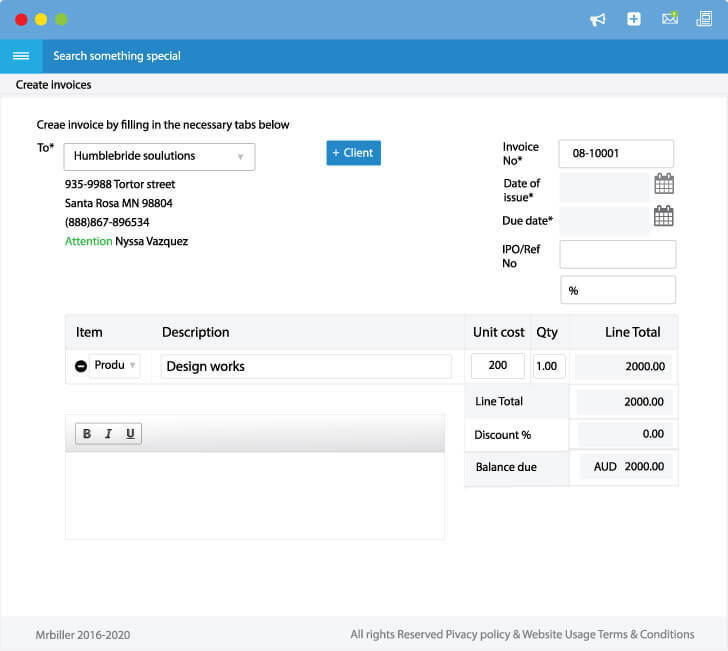 Mr. Biller is without a doubt one of the best free invoice creator products. 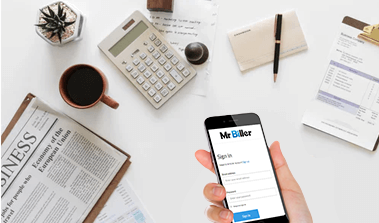 Start sending invoices with Mr. Biller today! 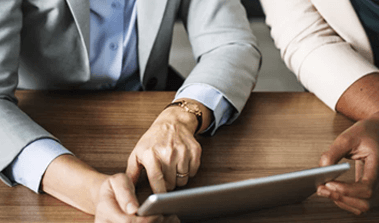 Whether you're new to your business, or have experience at small business accounting, our online support team has all the answers. We work hard to fix your issue fast so that you can focus on running your business. We're changing the way thousands of small businesses send and receive invoices. Here at Mr. Biller, we take data protection seriously. That's we back-up all your work and protect your data with a cloud-based backup. Professional branding – the way you want! download a PDF or print it with a click. 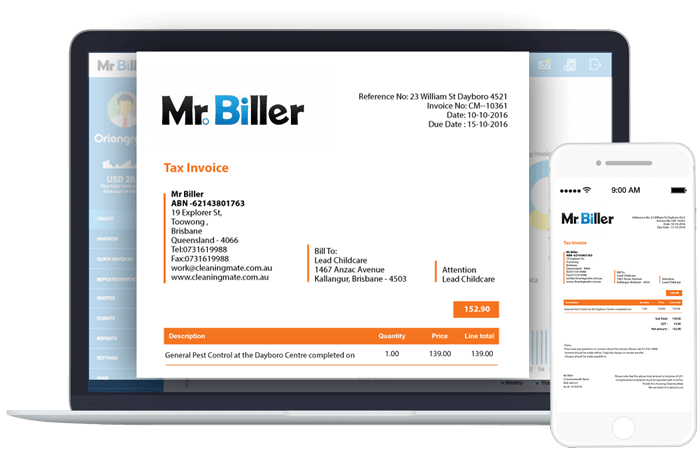 Mr. Biller is a free online invoicing system that lets you create and send invoices easily and at an affordable cost. It allows you to keep track of all your invoices and keep track of which ones are paid, outstanding, and overdue. The Mr.Biller invoicing tool has numerous features that make it an essential must have for your small business. "Great software that meets all our invoicing needs. Super easy to use, highly recommend this product"
"Wow... very helpful tool for small business people like me. I can easily track the invoices now. Great service..."
"Easy to use and no fuss. The software sends reminders too. Overall, good service. Thank you "